The United States has been through one of the most tumultuous decades in recent history. Polls show people on both sides of the ideological divide believe that the country has gone off track. In our summary of Reviving America, Steve Forbes and Elizabeth Ames explain how today's malaise has been caused by years of destructive policies, a broken tax system, and the Federal Reserve's Soviet-style controls over credit and money. This compelling summary shows how the United States can recover the optimism and entrepreneurial dynamism that made it the greatest nation in history. The United States has been through one of the most tumultuous decades in recent history. Polls show people on both sides of the ideological divide believe that the country has gone off track. If something isn't done quickly, Americans face a bleak future -- continuing decline and disarray in a world that grows ever more dangerous. 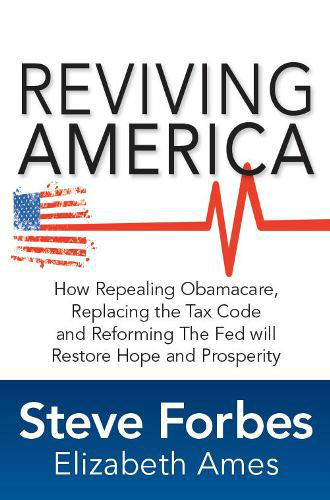 In our summary of Reviving America, Steve Forbes and Elizabeth Ames explain how today's malaise has been caused by years of destructive policies, a broken tax system, and the Federal Reserve's Soviet-style controls over credit and money. The problems are challenging. But with the right policies, the country can bounce back faster than people think. Forbes and Ames are the co-authors of Money, Freedom Manifesto, and the Wall Street Journal best-seller, How Capitalism Will Save Us. Forbes is Chairman and Editor-in-Chief of Forbes Media, which publishes Forbes magazine, with a circulation of nearly 1 million readers, as well as Forbes.com, which reaches nearly 70 million unique monthly visitors. This compelling summary shows how the United States can recover the optimism and entrepreneurial dynamism that made it the greatest nation in history.